Nutmeg and her boyfriend broke up today, and suddenly the whole mood in our own apartment turned somber. Nutmeg is a big girl, more than capable of taking care of her own needs or finding friends who can offer support, but the thought that she’s in pain and we can’t do anything about it has really colored our day. What had started out as an afternoon in which iDaddy and I were just lazing around, doing the Sunday Times crossword puzzle and thinking about when we should brave the cold to head downtown for Opera Night at Caffe Taci — an event we used to go to all the time when it was in our neighborhood, but which we’ve only been to a few times now that it’s relocated to Midtown — suddenly turned sad-by-proxy. And I’m having flashes of other weekend afternoons, when the girls were teenagers, feeling on call for them, poised to be available at a moment’s notice to retrieve them from a shopping mall or drive them to a friend’s house or just TALK to them, never really feeling like we could settle into doing whatever it was the two of us we wanted to do. Worse than that, really — because now we’re poised for something that’s so much more vague. We’re on pins and needles, but it’s over something emotional rather than logistical, and it feels a bit unearned and inappropriate. When the girls were little, they objectively needed us to get them places or buy them things. Now, Nutmeg is 25 years old, with friends of her own, a life of her own, problems of her own. How much of a role should iDaddy or I even play in this? Should we hop in the car and drive the half-hour to Brooklyn to keep her company, which was my first thought when I rushed to the phone to call her this afternoon? (She didn’t pick up.) Should we rescue her from the real estate headache the breakup will inevitably produce, offering to pay her boyfriend’s half of the rent on their one-bedroom apartment until the lease is up and she can move somewhere cheaper? Should we help her buy out his half of the couch? Nutmeg is already protecting herself from this kind of reaction, I think, by keeping us at arm’s length as she tries to work out her heartache on her own. She first told me this past Monday that she and her boyfriend were having a rocky time, after I hadn’t heard from her all weekend and had assumed she and he were busy doing fun stuff together. But in truth Nutmeg wasn’t with him at all, but was with her best friend, visiting from Boston, trying to find consolation over what she was sure was an impending break-up, talking and drinking and talking and going to a movie (which turned out to be the wrong one to have chosen at such a moment) and talking some more. I was hurt that she hadn’t turned to me at all over that weekend, but I shouldn’t have been; I’m not her friend, I’m her mother. What really hurt me was the suspicion that she hadn’t called me because she was pretty sure I would say the wrong thing, and she needed to brace herself for it. I pride myself on always saying the right thing to friends who are in pain, but I know that when I try to console my daughters, I often blow it. No matter how many times I’ve learned that offering, however obliquely, to rescue them is absolutely the wrong response, that’s almost always the response I offer. Umm — completely different? What’s THAT supposed to mean? Am I really so flummoxed by a good-looking guy saying something vaguely flirtatious? I went straight to the line that would cast me clearly as older than him — I’m waiting for my daughter, who almost certainly has to be an adult on her lunch hour — to make it clear that . . . that what? That I know I look middle-aged, and I don’t want to seem somehow pathetic, don’t want him to get the idea that I was getting any ideas? It seemed that I was hiding behind that “my daughter” line way too quickly. Our kids are always a reflection of our place in the world, and these days I mostly love how my own kids reflect me — except for the fact that they broadcast my age. It feels like only yesterday that I was walking little Nutmeg to school in first grade, holding her little hand and thinking that having a six-year-old daughter beside me made me look kinda young. Flash forward a mere 20 years, and Nutmeg makes me look old. How did that happen, exactly? The second encounter was professional — and in a way, it led me to do the same thing I had done at ‘ino Cafe, anticipating any private thoughts on the part of my interlocutor about how very very OLD I must be by invoking my daughters and getting there ahead of him. In this case, I invoked both daughters. I was meeting a young editor for the first time, at a magazine I haven’t written for before — he, too, was probably about late 30s, also tall and good-looking, and we were meeting at City Girl Cafe, which I walked to after lunch with Nutmeg. Within minutes of sitting down with my espresso, I brought up that my daughter had recently joined the same gym the editor had just come from. Then, for good measure, five minutes later I brought Meta into the conversation, mentioning that it was she who had turned me on, years before he was popular, to the cult of a singer-songwriter the editor and I were discussing. I settled down after a while, and as we talked about story ideas I didn’t hesitate to make it clear that I’ve been around covering some of these stories for a while — God, practically since before this editor was BORN. But it’s as though I had Nutmeg and Meta in my back pocket, and pulled them out when I wanted to give myself youth cred. How long do I think I can keep this up, hanging on by my fingernails on a wire stretched between the old way and the future? Kids are now spending more time with their screens and electronics than they are awake (you can double-count hours for multi-tasking). 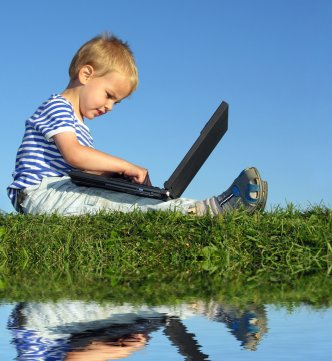 That’s the news from the latest survey from the Kaiser Family Foundation, “Generation M.” I guess Generation M is as good a name as any, at least for now, for these media-crazed 8- to 14-year-olds. But reading about the study in The New York Times this morning made me feel like these kids, who spend tk hours a day online, aren’t all that different from my own kids (Generation X? Y? Millenium?) or even, truth be told, from me, Ms. Baby Boomer. The article, by Tamar Lewin, has the headline, “If Your Kids Are Awake, They’re Probably Online.” I hate to say this, but if I’m awake and in the apartment, I’m probably online, too. If iDaddy is awake and even NOT in the apartment, he’s also probably online, thanks to the iPhone he carries around with him and whips out of his pocket at the slightest provocation (not necessarily to phone or text anyone, since he’s not super-social, but to check out google or imdb for an answer for just about any question that arises in conversation). So is this a bad thing? It depends. It depends on what it replaces. iDaddy has been on sabbatical this year, spending his weekdays on his own in another town, so I’m alone during the week and left to my own devices. (Interesting phrase, that, created in the era long before devices actually meant iPhones and iPods and all the other i’s.) So it’s been interesting to watch how much time I spend with what. I’m pretty device-deprived — we own one TV, though it does have TiVo, and my cell phone is an old-fashioned one that doesn’t even have a camera — and the only things I own that would qualify as part of the plugged-in stuff the Kaiser Family Foundation is concerned with, besides the one television, is my MacBook and my iPod, both a couple of years past their sell-by dates. In this relatively low-tech environment, I had high hopes for the things I would get done when I was on my own in the evenings — lots of reading (at the moment I’m enjoying The Unnamed by the wonderful young writer Joshua Ferris, though his first book, Then We Came to the End, was probably better), lots of organizing (do I really need all these pieces of paper in all these bulging file folders? ), lots of socializing one-on-one with people I feel guilty about spending time with when I know I’ve left iDaddy home alone in his study watching TV. But it turns out that the TV in the study is awfully appealing, even to me. And a sense of connection to the world outside my walls when I’m home without a drinks or theatre invitation — well, the idea of young people doing this to excess, I get it. What I don’t get is why they do these things when they’re NOT alone. It’s the people, no matter what letter is attached to their generation, who insist on staring at their mini-screens when they’re at the dinner table or sitting on the Acela or DRIVING A CAR who really perplex me. Being out in the world, eavesdropping, noticing, potentially even interacting — all that is so cool. Why is it that a cold hard screen has greater allure? The language maven Paul McFedries, curator of the Word Spy web site, is often spot-on about finding a language trend that reveals something fascinating about pop culture. I’m not so wild about what today’s Word of the Day reveals about us. Today’s word: the mommy card. Here’s how McFedries describes it (with citations of its earliest uses, a cute modern interpretation of the Oxford English Dictionary’s style). n. A calling card that includes a mother’s name and contact information. Also: mom card. Being a parent is a job in itself, which is exactly why Carrie Hendrix developed “mommy cards,” business cards for parents….Depending on the design chosen, some mommy cards come with a bit of ribbon snaked through them. It makes them stand out from the everyday card, Hendrix said. In the past few years, “mom cards” of all description have been showing up at baby groups, soccer fields and playgrounds. Some are printed with cutesy one-liners (“Get your mommy to call my mommy”) while others are emblazoned with damask or leopard prints. But the basic information is the same: the mother’s name, phone number and a job title such as Rugrat Wrangler or Annabelle’s Mom. Tracy Ottinger left behind her suits and business cards when she decided to become a stay-at-home mom. She didn’t miss the suits, but she was frustrated at not having a convenient way to provide information about herself. She started making her own “mommy cards” that listed her job, “Mother of Jake and Eli,” her address, phone numbers and e-mail address. I actually thought, when I first saw the word, that it referred to someone PLAYING the Mommy Card, sort of like the Race Card –“No, sorry, I can’t get involved, I’m the mother.” Or, better yet, “You better let me into your room, buster, I’m the mother.” But this meaning, a literal card that people are literally using — eeuw. No matter how central a part of our self-identities being a mother might be, surely there’s a less tacky way to announce it. (How’s this for a suggestion: don’t announce such a thing at all. Ever.) In the end, though, maybe this is just one more indication of how much things have changed since Meta and Nutmeg were little. Ah, the good old days — no cell phones, no soccer moms, no business cards. The new online publication Boom Underground has a category of articles that it calls “Offspring.” It’s the work of Brooklyn writer Julie Mihaly, and it’s brand new, so most things seem to be still “under contruction.” But the promised first article in the “Offspring” section, visitors to the site are told, will be called “Guess Who’s Coming to Dinner . . . and Breakfast . . . and Wants You to Do the Laundry.” The subtitle: “When to Give Of-Age Kids the Boot.” I look forward to reading this article when it finally appears — and to reading lots of other articles on this web site, which is beautifully designed in a funky, fifties-inspired way — and to thinking about it in terms of the findings of the Purdue researchers I wrote about in a previous post. Turns out parents might end up giving “of-age” kids “the boot” — but even after the adult kids skedaddle, three out of four of their parents will keep on giving and giving and giving. I guess it’s true that when adult kids hang around too long, or come back home to live with their parents again, it can be pretty destabilizing, especially if the parents have sort of gotten used to the pleasures of the empty nest. But isn’t it possible, at least sometimes, to negotiate ways to have the kids back home (or still home) to everyone’s satisfaction? I keep thinking of Robert Frost’s definition of home, the place where, “when you have to go there, they have to take you in.” (I was surprised, looking for the original reference to that line, that the poem refers not to a wayward son returning home, but to a hired man.) What happened to that kind of commitment? Tight quarters might be one problem (I’m especially aware of this now that I live in a cramped Manhattan apartment), but in most middle-class American households, I’m sure some sort of deal can be struck to keep parents and children out of each other’s hair. Much more difficult than the invasion of physical space, of course, is the invasion of psychic space — and there’s the real problem, I believe. When kids come back home, they become kids again. When you know they’re out for the night, you lie awake worrying until you hear their car in the driveway. So maybe a first step, when parents “have to take in” one of their adult children, is to make it clear who does the laundry. 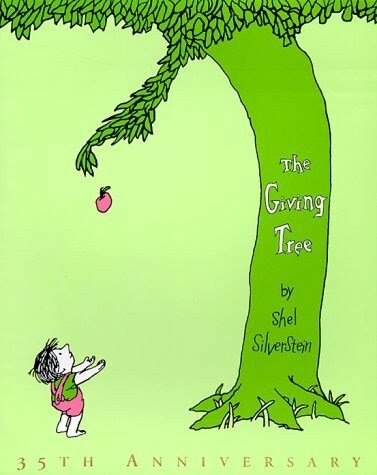 One of my favorite books to read to Meta and Nutmeg when they were little was The Giving Tree by Shel Silverstein. It’s about a tree and a boy. The tree gives the boy everything he needs as he grows — branches to swing in, shade to rest in — but when he becomes a man he moves away and forgets about the tree. Over the years he occasionally comes back, beaten down by the burdens of being an adult, and the tree gives “the boy” whatever he needs at the time: wood from its branches to make a house for his family, and later an entire trunk to make a boat so the boy can sail away to escape his despair. I always got all teary by the last page, when the tree is reduced to a stump and the boy is reduced to a craggy, bitter old man. In the end, at last, they give each other what they need. He has a stump to sit on, and the tree has the boy. Shel Silverstein understood how parents feel about giving to their children. It’s a one-way street, mostly. And it’s forever. Scientists at Purdue, Penn State, and the University of Michigan have been studying middle-aged parents and their young-adult kids, and it looks like Shel Silverstein was on to something. Three out of four of us, they found, give our adult children some kind of “support,” either financial, emotional, or logistical, on a regular basis. A generation ago, when asked if they had provided practical support to their grown kids in the previous month, only about one-third said yes. I don’t find this surprising, and in fact I find it kind of cool. We remain in our kids’ lives, something my own mother always wanted but which I resisted when I was a younger woman bristling away from her. I’m glad that my daughters don’t resist my help and my involvement in their lives for the sake of some stubborn notion about what it means to be independent. The study’s lead researcher also thinks it’s kind of cool. Karen Fingerman, a psychologist at Purdue, told me when we spoke last Tuesday that there’s nothing inherently wrong with being involved in one another’s lives — many young people are “thriving,” she said, when their mothers (and occasionally fathers) are a frequent source of advice, support, and affection. It’s not necessarily a matter of helicopter parents holding on too tight, nor of adult children’s failure to launch. Sometimes middle-aged parents and their young-adult children just stay enmeshed because they kind of like it that way. Fingerman and her co-authors published their findings last month in the Journal of Marriage and Family. in a paper with the catchy title “Giving to the Good and the Needy.” The title says it all. This is what parents do — we give to our adult children when they need it the most, and we also give to our adult children from whom we derive the greatest naches (look it up). are you sorry you had children? A 24-year-old woman named Bailey writes in today to Lisa Belkin’s blog Motherlode asking a straightforward question: Why does anyone have kids? She’s an engineer, and she’s trying to approach the question rationally instead of emotionally. Wow — good luck, Bailey. iDaddy and I asked ourselves the same question back in about 1978, when we’d been married for 5 years and had bought our first house and iDaddy’s assistant professor job seemed vaguely secure and my journalism career was going pretty well. Isn’t it about time now to have our baby? I asked. (I had to be the one to ask — iDaddy never was the one to recognize when it was time to take the next life-transition step.) We sat down at the dining room table and made a list of pros and cons. The con side was mighty long: it was expensive to raise children, and we knew it would ruin our relationship at least for a little while, and blah blah. The pro side was distressingly short, and in the end it boiled down to one item that seemed to trump all the others: if we didn’t have children, then when we were in our 40s (an unfathomable old age to us in those days), we would regret it. We would have regretted it, I’m sure of it, and I’m so glad in retrospect that we threw the list away and just started procreating. But my heart goes out to Bailey — and to Meta and Nutmeg, too, when the time comes for them to make the same decision. I’m curious to see what Lisa Belkin’s loyal readers (her blog is found at the New York Times web site) write in about whether they’re glad to have had kids, sorry to have remained childless, sorry to have had kids, whatever. A lot of it, of course, will be related to how their own stories ended. Our kids, at least as of now, have turned out beautifully, so regret over having them just isn’t on my radar at the moment.